Faced with the prospect of queuing for hours - or even overnight - for a registration ticket for admission to the Beijing Children's Hospital, parents are prepared to fork out up to 600 yuan to a scalper. The going rate for a 5 yuan (80 US cents) registration ticket is 200 yuan ($32) for a general appointment and 500-600 yuan ($80-95) for a specialist appointment, according to the Beijing Daily newspaper. To investigate the scalper situation a reporter from the paper went to the children's hospital foyer and posed as parent seeking admission of their child for acute illness. He didn't have to look far - in fact he didn't have to look at all, as he was surrounded by a group of three scalpers all shouting out offers of a variety of 'appointments' and proferring their business cards. They said they could supply registration tickets for appointments on any time and also for any department . Scalper: What department do you want - general or specialist? Reporter: How much is a general ticket? Scalper: 200 yuan. Can arrange any date within the next three months or next week. We have today, tomorrow ... you get the idea. Every day, every department. Reporter: What about the 'named user ticket system' [similar to train ticketing, in which tickets are only valid for the user ID]? Scalper: No problem. We've been doing this for eight years. Just use my ID to get in the clinic, then switch when you get to see the doctor. On the electronic screen in the hospital foyer there were almost 70 different clinical departments listed, and the screen showed that 90% were 'sold out' - no appointments available. Despite this, long lines stretched back from the registration ticket office window. One father from Shaanxi told the reporter he had been waiting all night without success, and so had turned to the scalpers to get a registration ticket for his sick child. He said he had seen at least ten scalpers operating at the hospital. Several of them were openly touting for business along the line for the registration office. Sometimes they helped each other out and 'swapped' tickets, sometimes they strove to undermine or 'outbid' their competitors. It was a very chaotic situation. According to a spokesman for the nearby Yuetan Police Station, there were more than a hundred hospital scalpers operating in the area of the hospitals. Although they operated quite openly trying to 'recruit' customers in the queue, arresting them was not easy. This was because they had to be caught 'in the act' exchanging tickets and their illegal sale of tickets had to be confirmed by the person buying them - but most refused and fled. 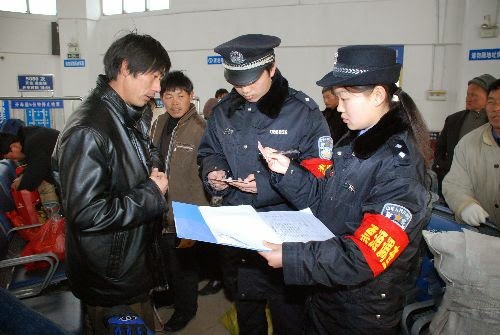 And even when caught, they scalpers faced a maximum of five days in detention and a 50 yuan fine. This was only a fraction of a single 'sale' of a ticket for 200-600 yuan, and thus was no deterrent, the police spokesman said. With no effective law this meant "social order is disturbed", he concluded.